Pasquale Stafano and Gianni Iorio "Mediterranean Tales"
A beautiful musical journey into Mediterranean Music! 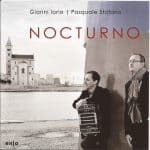 Pasquale Stafano and Gianni Iorio play together all around the world since more than 20 years. After the project “Nocturno” and the album produced by Enja Records by Matthias Winckelmann in 2016, the two musicians based in South Italy continue their musical journey with “Mediterranean Tales”. New music, new compositions, tales of people, encounters, passion, love translated into original compositions that have as their lead the journey in the time and space in the music, from jazz to world music, from classic to rock and to the Mediterranean melody that is always on the background. Each song is a vibrant tale of emotions, energy, big interplay and moments of creativity with great improvisations that make each concert unrepeatable. The success of this duo, which is performed all over the world and, in recent years, very much in Asia, is in the original compositions performed in every concert always in different way due to the great feeling between the two musicians. They make very interesting musical conversations between their instruments, where the arrangement, in pure “chamber style”, is very important in raiseing the counterpoint and the lyrics structures, which are elements recognizable in the classical European tradition.